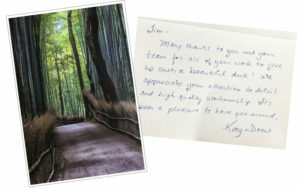 Kay & Drew (Sun Prairie, WI): “Many thanks to you and your team for all of your work to give us such a beautiful deck! We appreciate your attention to detail and high quality workmanship. It’s been a pleasure to have you around. Dan & Carol (Lake Mills, WI): “Thank you so much for our beautiful deck! [We are] so happy with the end result. . . It was a pleasure having you work at our home. Bill & Meg (Blanchardville, WI): “Would we use Tim Quigley again for a deck project? Laurie (Madison, WI): “They installed a cedar picket fence in our back yard. It went very well. Ashley (Middleton, WI): “They replaced railings, posts and spindles with new red cedar, and brought the railings up to code. Mary (Madison, WI): “We are really enjoying the back yard and the great transformation you produced back there. We appreciate your attention to detail and high quality workmanship. It’s been a pleasure to have you around! Suzanne (Madison, WI): “Thank you so much for being so kind to us! You went beyond the call of duty a bit. Your work is beautiful! !